So we're moving to Ohio toward the end of the year, and I'm going through tons of crap and reevaluating everything. What can I chuck and what do I save? I have to keep in mind all those past moves when I tossed stuff and later wished I hadn't. For instance, I have piles of fire-code-flouting paper ephemera, mainly old newspapers. I should point out that when I say "old newspapers," I mean from the seventies, historical-like, in a somewhat ordered collection. Oh, and I have every daily paper of the last few years of The Oregonian, stacked in the shape of furniture. You know, for practicality's sake. So I'm keeping all the intact papers I grew up with (Newsday, NY Post and Daily News), maybe keeping some Portland stuff (a complete July 4, 1976 Sunday Oregonian), but getting rid of all the partial issues and random stuff that accumulates when you're that nut who buys an armload of crummy old newspapers for a dollar at estate sales. Then there's the impersonal papers. I guess I can cast off those 16-year-old electric bills from five moves ago... Ha ha, just kidding, I threw those out last year. Then the personal papers, like scribbled-out song lyrics and set lists for a handful of long-ago coffeehouse gigs. Kept the set lists, pitched the lyrics, which exist elsewhere. Kept the scrawled words, however, to a song Mike and I wrote for our overdubbing of the Emmett Kelly movie The Clown and the Kids. A long time ago, I had a VCR deck that allowed you to put new audio onto a VHS tape, so we wrote and improvised a plot and songs for this dreary dollar-bin discovery. Gary Cleanberg himself compared the new score to Neil Young. And he liked Neil Young. Everybody fucks up once in a while! It doesn't mean you have to go through life without a smile! Besides, who will care a hundred years from now? My god, are you still reading this? I only wrote this post because I didn't want March to slip away without one. Sat down at this keyboard tabula rasa and I suspect I'm getting up the same way. 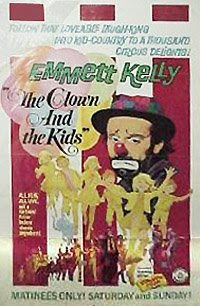 Okay, so we all feel stupid, let's leave it at that, and just be glad I can't remember the words to "Everybody Hates a Clown," or the one where Emmett lures the children of Scrabbyville to the circus, singing that he will take them "to a place where magic grows and midgets can run free." Go look at something else now. Pick a link over there to the right. Lots of what I like to call "edutainment" to be found there!